The first time LaBrelah was on a horse she was eight months old. Today, she is an accomplished barrel racer in Southern rodeo circuits. 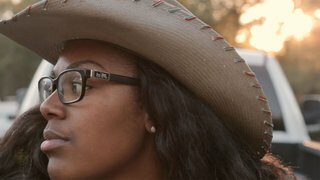 With her family’s unending support, this Mississippi cowgirl is driven to compete, driven to win, and driven to become the first African-American woman in the National Finals Rodeo. She was born to do this. Nathan Willis and Sherry Anderson are award-winning documentary filmmakers based in the American South. Nathan has directed documentaries for MSNBC, Vice, Fusion, and the Academy Award-winning production company, Participant Media. He’s passionate about making the world a more beautiful and empathetic place. Sherry is an independent Creative Producer who focuses on short form narrative and documentary films. She has produced television programming for TLC, Discovery Channel, and National Geographic. Sherry has a penchant for forgotten and little-known stories of the South. The pair began working together in 2015 when they produced a documentary commemorating the 10th anniversary of Hurricane Katrina. The next year, the two-person production team conceived, shot, and edited “Cowgirl Up” as part of a five- day documentary filmmaking competition. It premiered at Slam dance as part of the challenge and won a Best Film Award and Best Directing. Read the full Q&APBS spoke with Creative Producer Sherry Anderson about LaBrelah Hutchins' passion for barrel racing and the ongoing support she's received from her family since childhood. PBS: Her father Larry also mentions that while her family supports her whether she has a good run or not, LaBrelah can be hard on herself. Were you able to get a glimpse of this drive and work ethic? Sherry Anderson: Yes, during the short time we were with the family, it was evident how passionate they are about horses and rodeos. Not only does Labrelah compete but her siblings and extended family members all participate in rodeo events. It is an inherited trait throughout the Hutchins family and beyond. We also felt a sincerity about their love for each other and their commitment to excellent horsemanship, but also a humbleness that one doesn’t usually see in competitive sports. There are no “stage mothers” (or fathers). There is a quiet strength and confidence about them; the stress one would anticipate in preparing for a big competitive event just isn’t there. We hope to convey that in the film. I believe that Nathan [Willis] was the perfect person to shoot this documentary because of his own calming and curious nature. He was able to get up close and personal with the family and animals without disrupting the atmosphere; and, since we were only a two-person production team, we did not bring that particular type of chaos that comes with a larger crew. Reel South is a public TV series dedicated to showcasing the authentic documentaries that give an inside look to the American South. Reel South is brought to you by UNC-TV, SC-ETV, and the Southern Documentary fund.